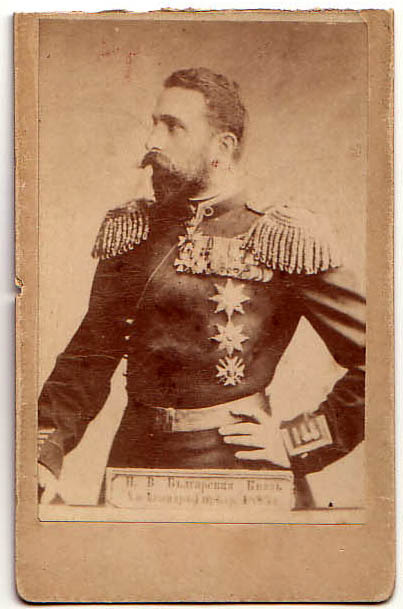 For most western Europeans, Bulgaria tends to be a country blurred and lost in the far east corner of the European map. Sandwiched between Romania, Greece, Turkey, Serbia, Macedonia and the Black Sea, the country is a treasure box worthwhile to be discovered. A possible gateway is the so called “Friendship Bridge” over Europe’s largest river, the Danube, linking the Romanian border town Giurgiu (at only 60 km south of Bucharest) to the Bulgarian town of Ruse. 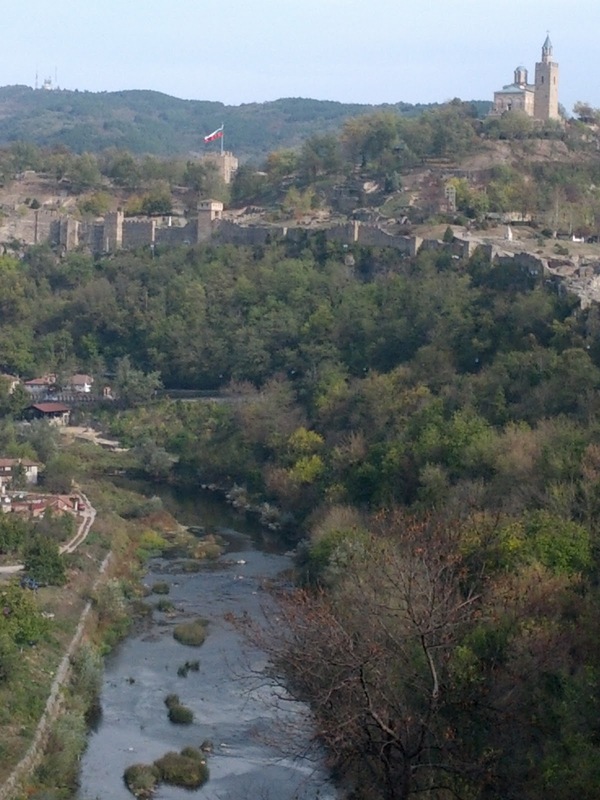 Either you are renting a car or using the extensive bus network, I would recommend to head 100 km to the south-west to the town of Veliko Tarnovo. Why come to Veliko Tarnovo? First of all for its natural setting: I opened the window of my hotel room and I see a giant natural amphitheatre with the new town on my right and the old town on my left, with houses gathered together on abrupt slopes. Yantra river meanders and increases the beauty of the place together with the rolling mountains in the background. 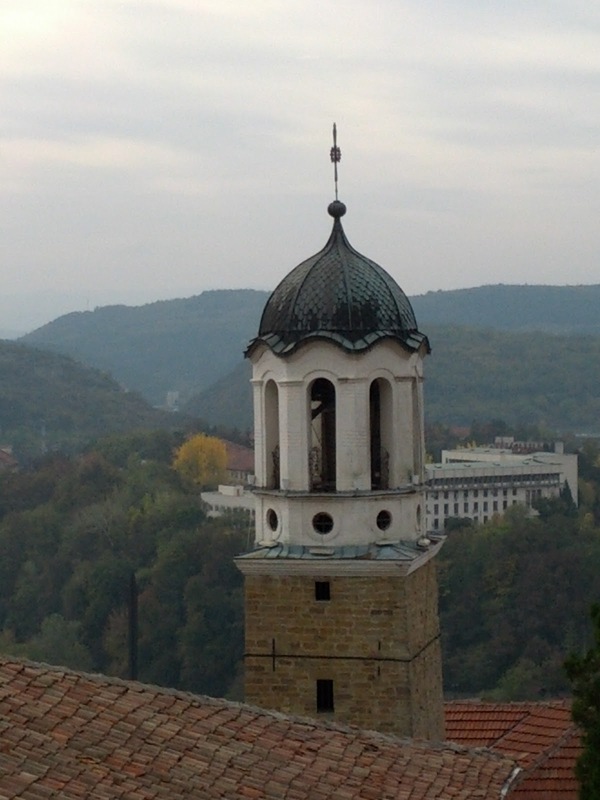 It was here where in 1185 two local noblemen started the liberation movement under the Byzantines and founded the capital of the Second Bulgarian Kingdom that stretched from the Black Sea in the east to the Adriatic in the west and the Aegean sea in the south. In 1393 the Ottomans conquer the fortress commencing 500 years of occupation and a different dynamic of development. 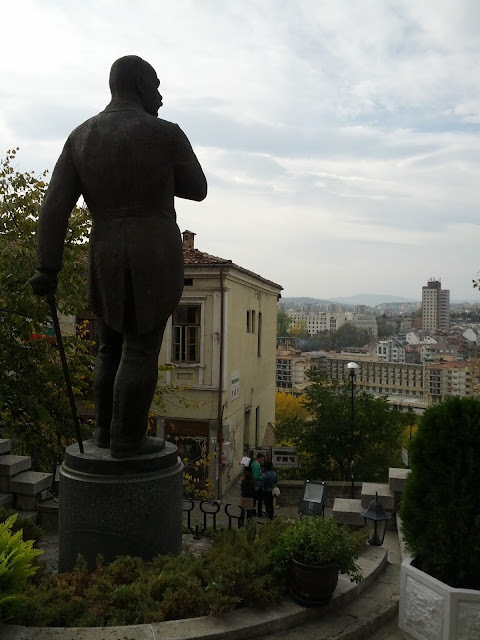 After the liberation in 1877, Veliko Tarnovo becomes again capital for 2 more years when the elected Prince Alexander Battenberg and the first national assembly moved the capital to Sofia. Tsarevets medieval fortress is the most visited historical site in the country. The fortress impresses more by its strategic location and the beauty of the scenery. Except the walls, bastions and the patriarch’s cathedral on the tip of the mountain, the visitor needs to fuel his imagination in order to get excited by the ruins of over 40 churches, the royal court and hundreds of dwellings. The poor signs (in Bulgarian, Russian and German) don’t give too much insight either on the Ottoman period and archaeological excavations are scattered with reconstructed sites, making difficult to distinct the original from the newly done. The highlight of the fortress though kicks off in the evening hours. Every night at 8.20 pm a 20 minute light and music show tells the history of Veliko Tarnovo and Bulgaria. 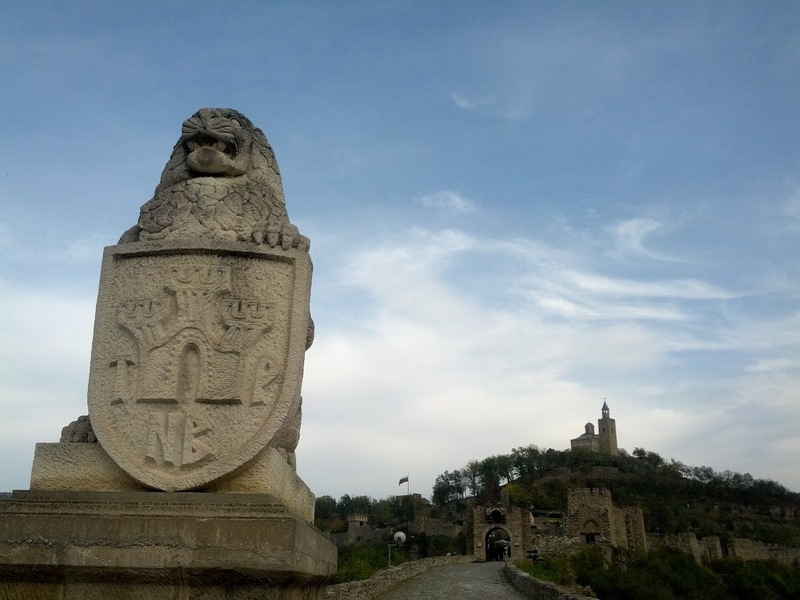 Veliko Tarnovo is not only the fortress. In case you are not on a tourist marathon of ticking the main places in your guide books I would warmly advise to loose yourself on the small streets that go up and down the hills, exploring the views of the church domes, the traditional houses surrounded by flowers and shady vine. It is a place where time flows slowly and densely, a place to hear the sound of your steps and take a deep breath. Even if you are not religious, enter in a small church and sense the sound, the light, the cracks in the paintings or the darkness of the time that covers the icons. The House of the Little Monkey designed in 1849 in national revival style by the local architect Kolyo Ficheto. 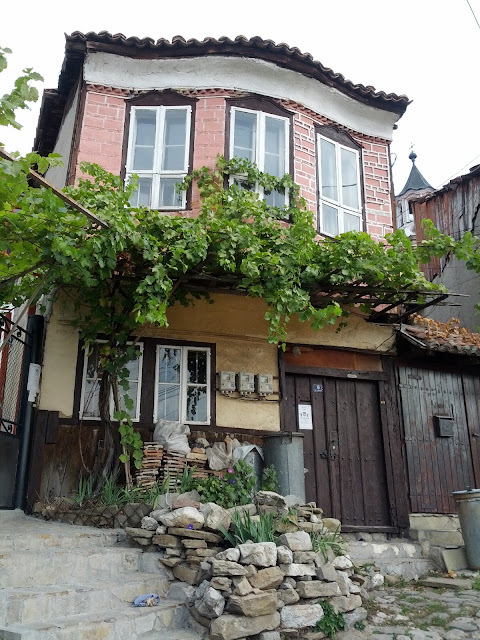 Hadji Nikoli Inn is the last surviving inn of 70 that used to host travelers here in Tarnovo. 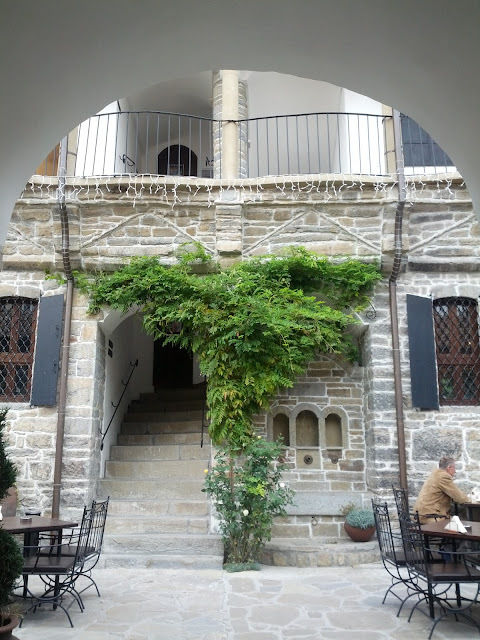 Built in 1858 by the master builder Kolyo Ficheto is beautifully restored and hosts an art gallery with exhibitions on loan from Bulgarian museums. 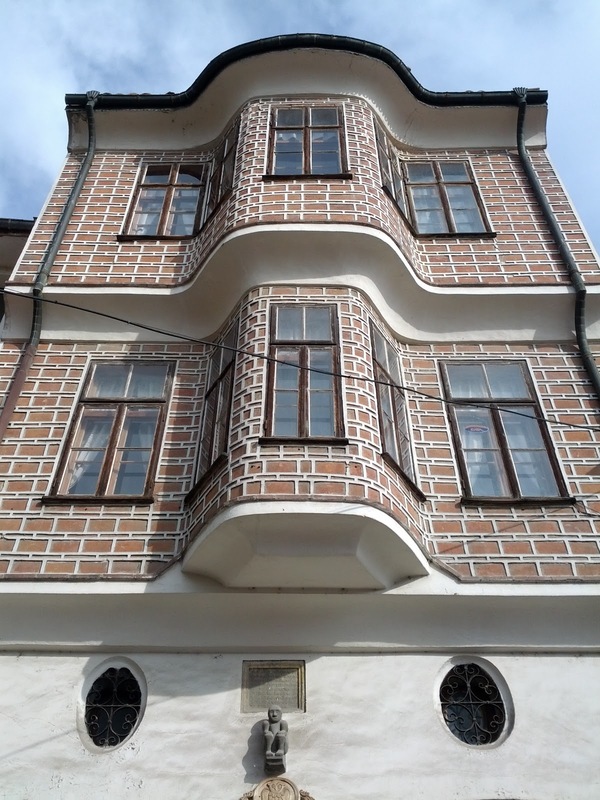 The former inn is located in the charming Samovodska Charshiya (or market) district with many souvenir shops as well as workshops. I particularly enjoyed meeting the icon painter, Ventsislav Shtarkov and his icons done on old wood. 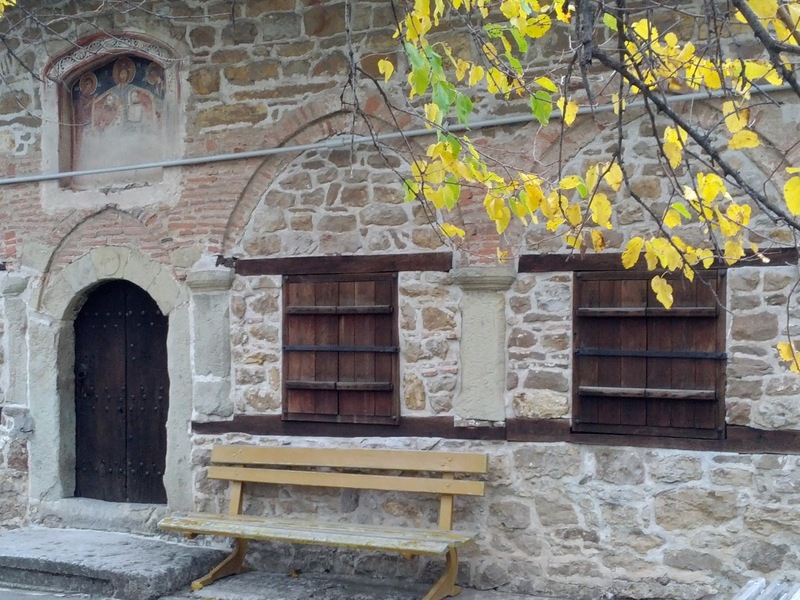 Situated at only 5 km from Veliko Tarnovo on the hights of the neighbouring mountains, Arbanassi is a must see village dotted with medieval tiny churches that treasure fine Eastern Christian art. What really impressed me was the small scale of these churches. In fact the piousness of a community is not measured by the heights of the cathedrals and the human scale of the buildings are creating a fairy tale like place. 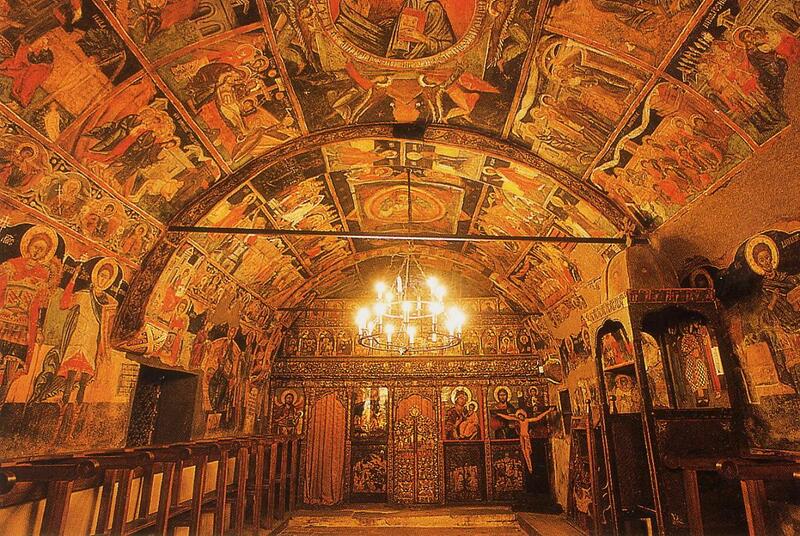 There are 4 small churches and 2 monasteries all covered inside with beautiful frescoes. 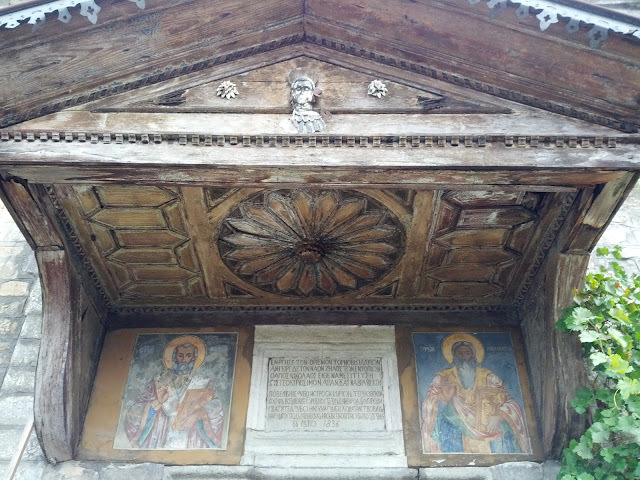 Worth to mention is the Church of Nativity and the three handed Madonna miracle making icon in the Monastery of the Sveta Bogoroditsa (Holy Virgin). Tip: start your day visiting the churches in Arbanassi as they tend to close earlier than the foreseen timetable. The village was established during the 15-th century by Albanian Christian refugees from the Ottoman threat that continued to use Greek language throughout the time. 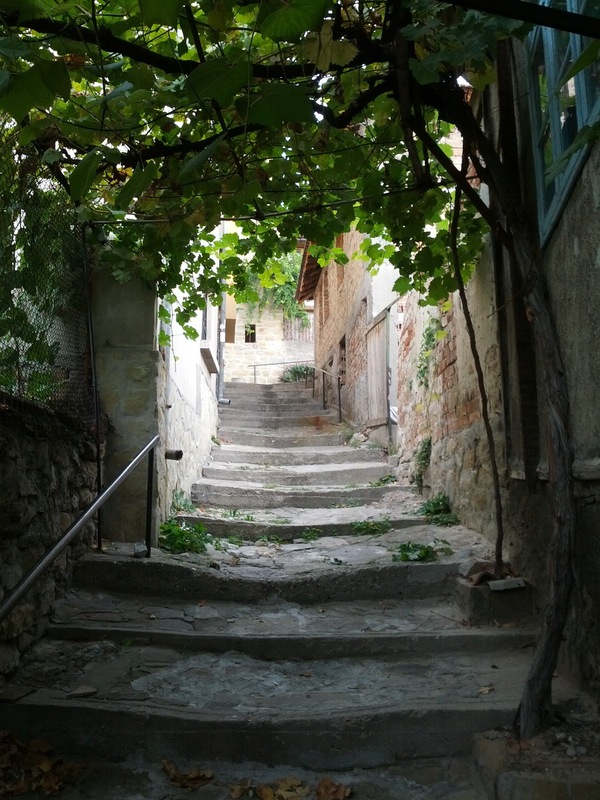 In exchange for guarding the pass giving access to Tarnovo, the inhabitants were granted autonomy and fiscal privileges. 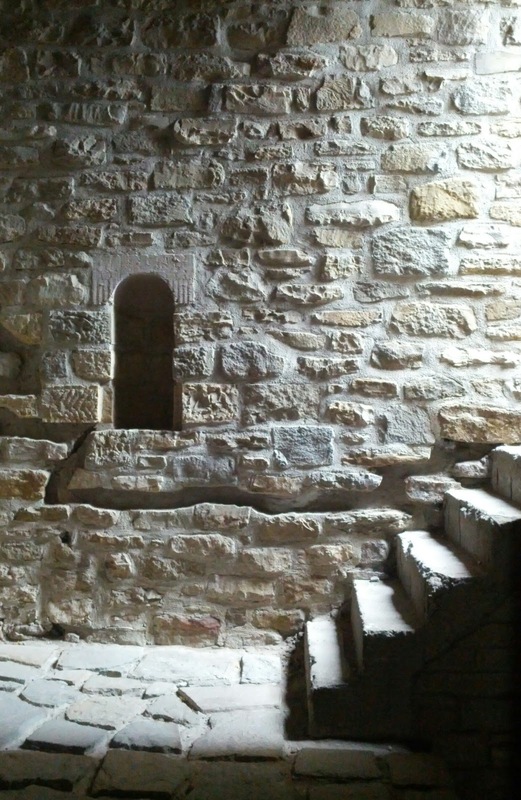 This encouraged local manufacturers and craftspeople and the place flourished till 1798 when Ottoman bandits’ raids brought with them the fall. This St Dimitur Church, the place where the aristocratic brothers Assen and Peter declared independence from the Byzantine empire in 1185. If you ask me what impressed me most from my short Bulgarian visit I would say it loud and clear: the food! I believe that Bulgarian cuisine could compete with the Mediterranean one in terms of flavours, the balanced use of spices, textures, colours, combinations, the Ottoman heritage blended with the local diversity of ingredients: organic vegetables, fruits, cheeses, meats, nuts. 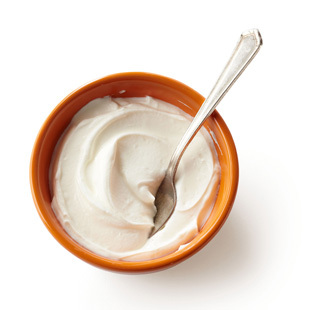 In fact we need to thank Bulgarians for inventing the yogurt! When shopping in Veliko Tarnovo look for a music CD with the “Mystery of Bulgarian Voices” (Le Mystere des Voix Bulgares) – Bulgarian State Television Female Vocal Choir. Their voices seem like coming from the depths of time, striking with their timbre, modal scales and dissonant harmonies. With this unique experience I can easily imagine how the songs of the antiquity mermaids could have sounded. When listening I feel charmed and taken away in a dream-like land. 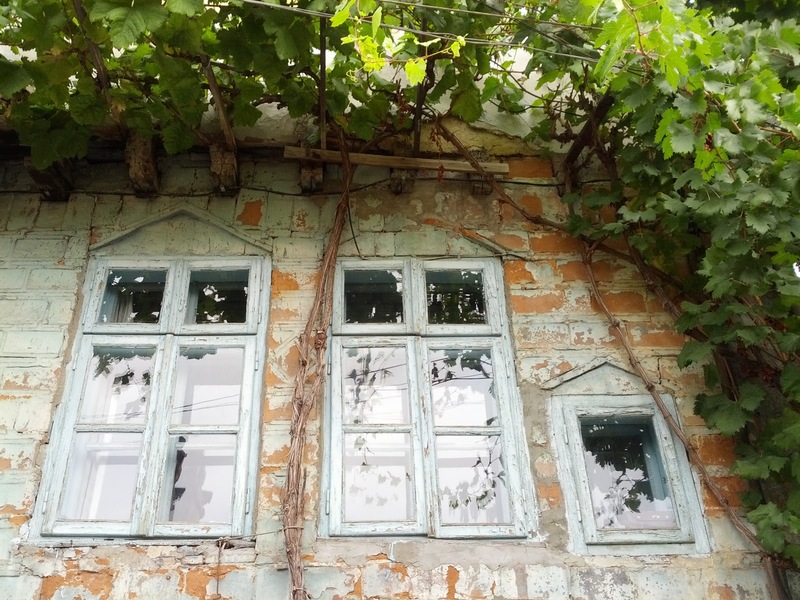 Bulgaria has all the ingredients of charm: untouched nature, human sized architecture, spirituality, warm people, rich traditions and folklore, tasty organic food and loads of sunny days to enjoy.